Exoskeletons can be incredibly useful, giving people extra strength or the ability to move freely when injured or disabled. But augmented performance comes at a cost, and users usually have to put in more effort while wearing these prosthetics. Scientists are trying to fix this: they have developed a new system that actively saves the user’s energy by adjusting the exoskeleton to their body’s natural movement. Now, the idea that exoskeletons consume additional energy may seem a bit counterintuitive. After all, aren’t they supposed to make things easier? According to biomechanist Juanjuan Zhang, who led this latest research, the problem is that exoskeletons are built on a one-size-fits-all system, and not tailored to the individual. This means users often fight against them unconsciously, or just find them uncomfortable to wear. This takes up energy. The solution proposed by Zhang and her team in a paper published in Science today is an algorithm that automatically adjusts the exoskeleton to the wearer’s body. The researchers tested their method with an ankle exoskeleton designed to help volunteers walk more easily. The exoskeleton clips onto the shin and foot, with a motor and a pulley system lifting up the back of the heel with every step. The amount of energy the volunteers expended was measured by monitoring their breathing, and the software automatically tweaked the exoskeleton to see what movement helped most. For example, it would try lifting the heel earlier or later during a step, or applying more or less energy, to see what suited the wearer. This diagram shows how the exoskeleton’s mechanism was adjusted. The lines show when during a step the motor was activated, and how strong it pulled on the heel. The research is limited in some ways. 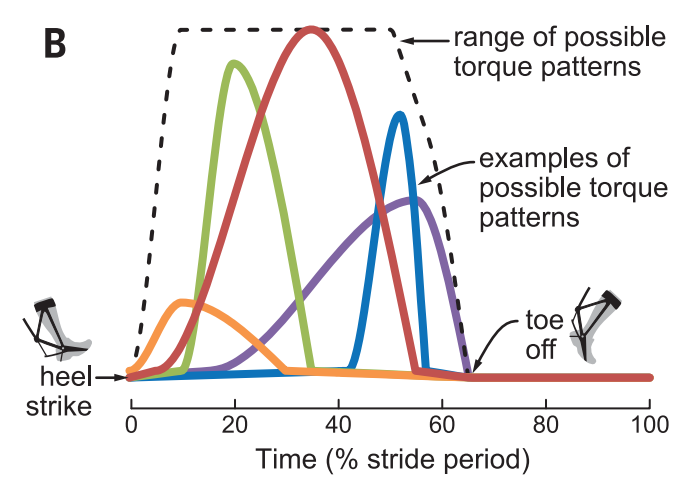 For example, only four different factors were being adjusted in the ankle exoskeleton. For full-leg or full-body exoskeletons, there would be many more constraints to think of, and this would take more time and computing power to process.